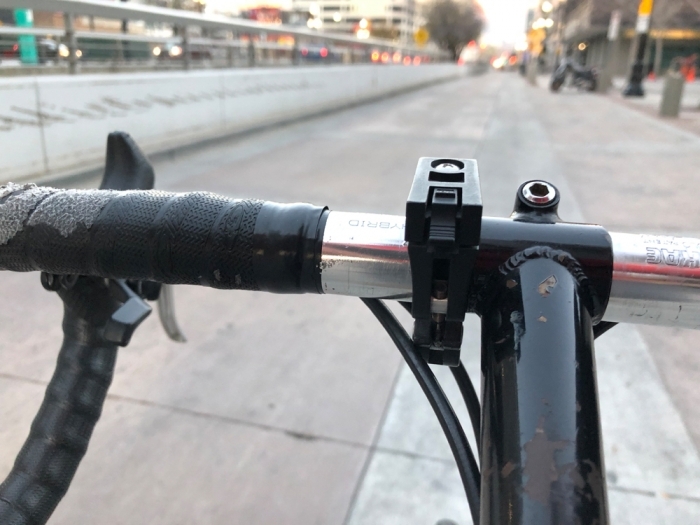 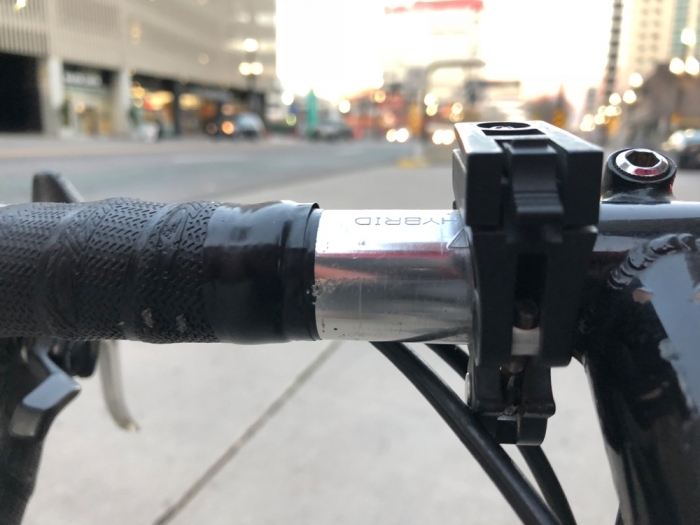 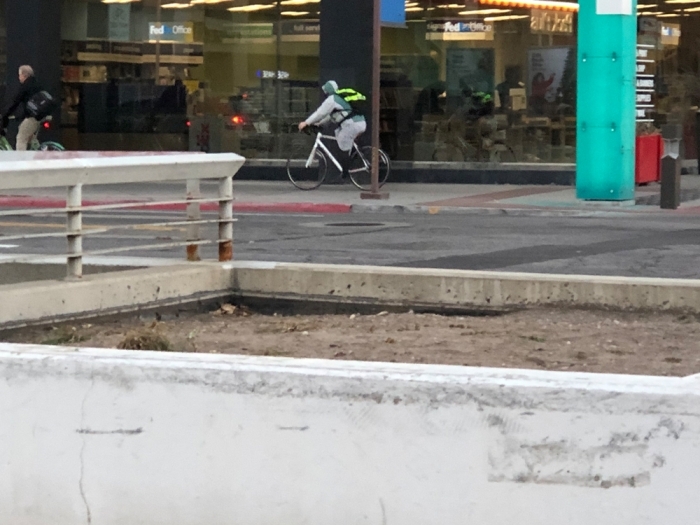 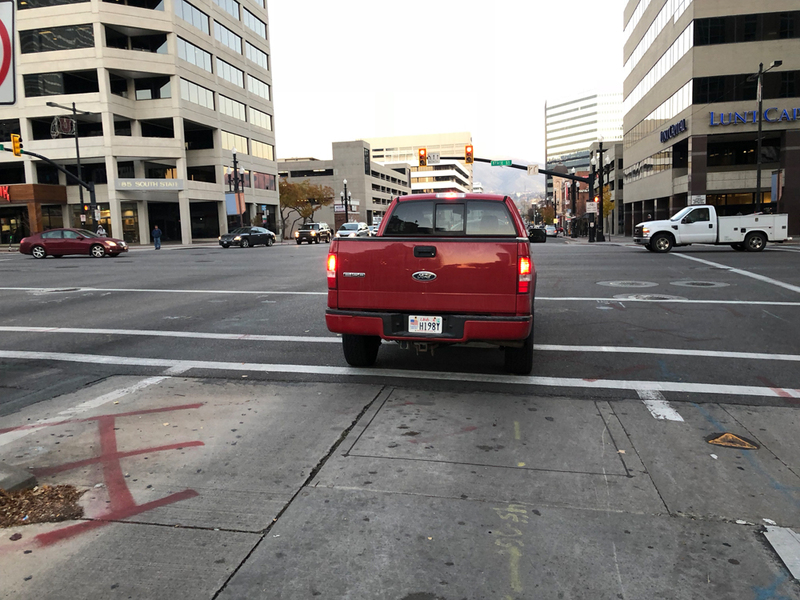 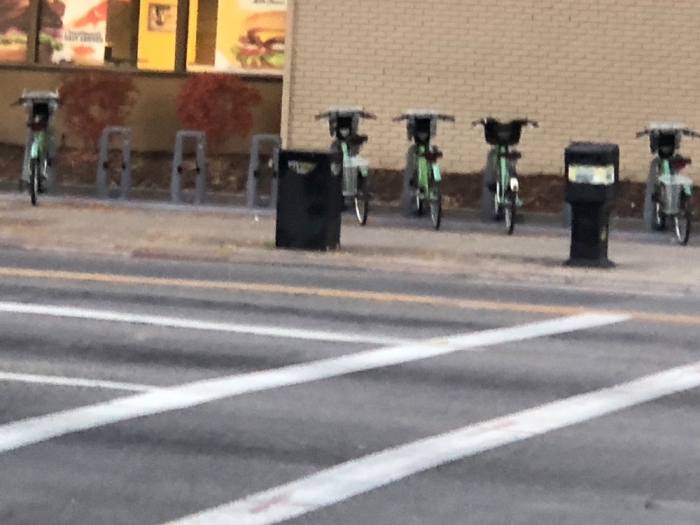 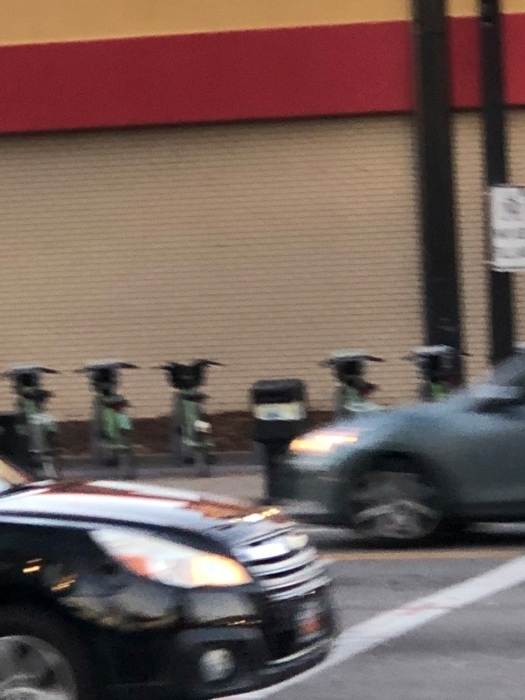 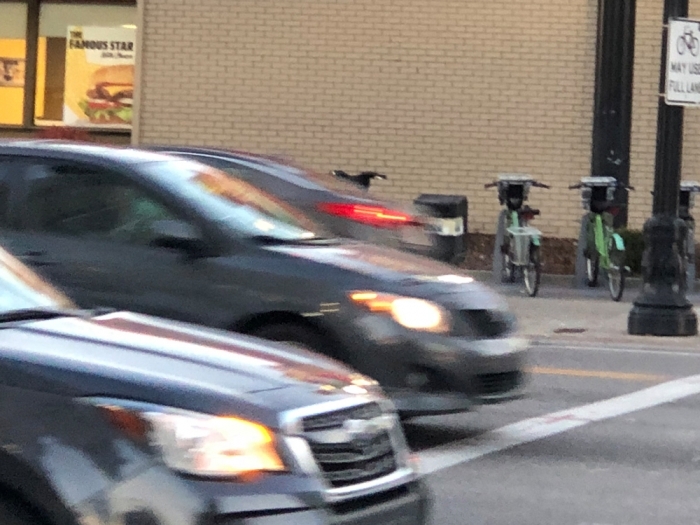 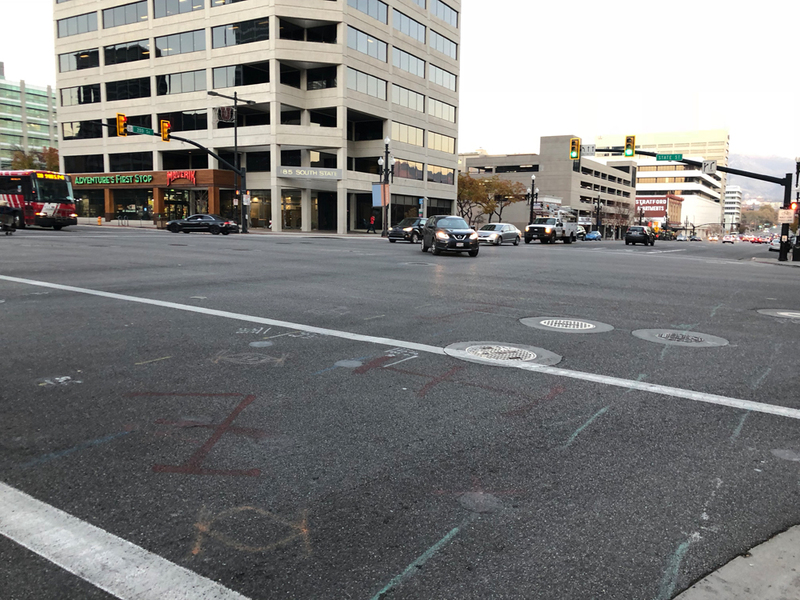 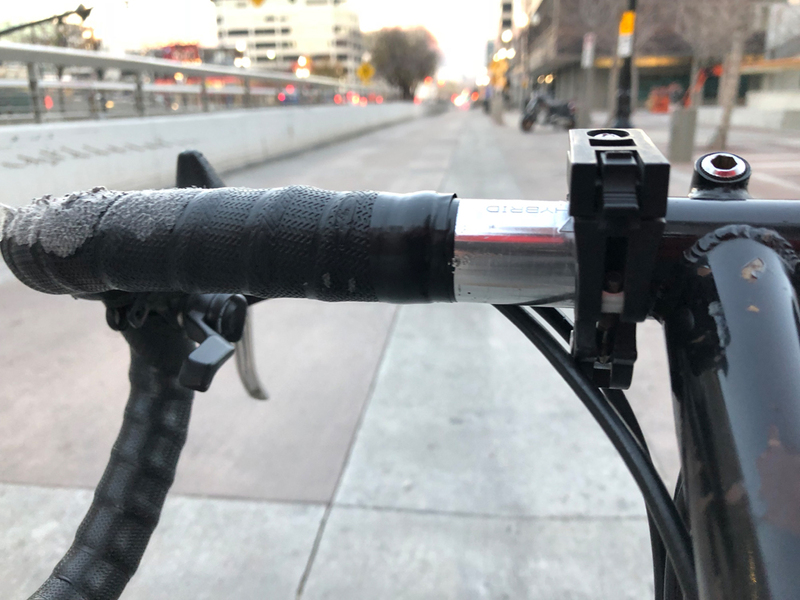 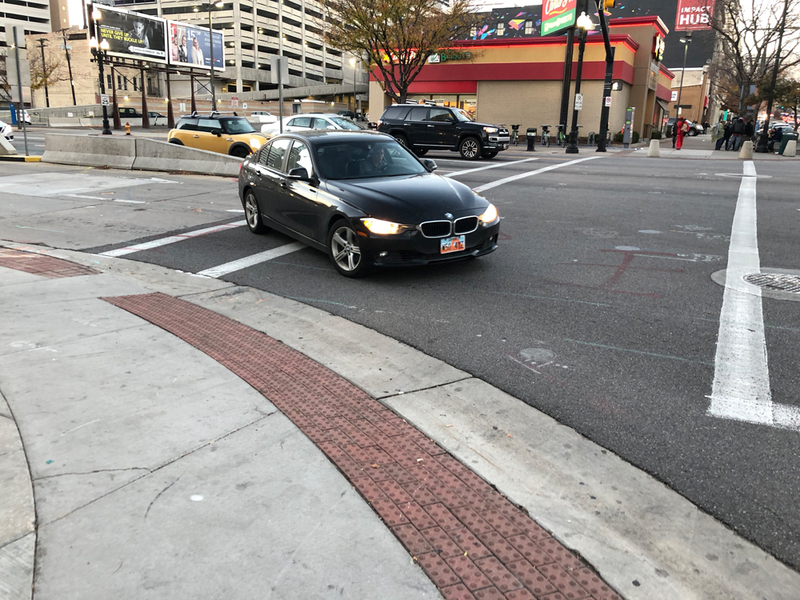 November 23, 2018 – Just last Friday, we were riding eastbound on 200 S between State and Main where the Green Shared Lane is (used to be) when a white Forerunner came within 1 foot of sideswiping one of us. We were riding where we were supposed to be heading to a destination on 200 S. This was very disconcerting, and is prompting this editorial. 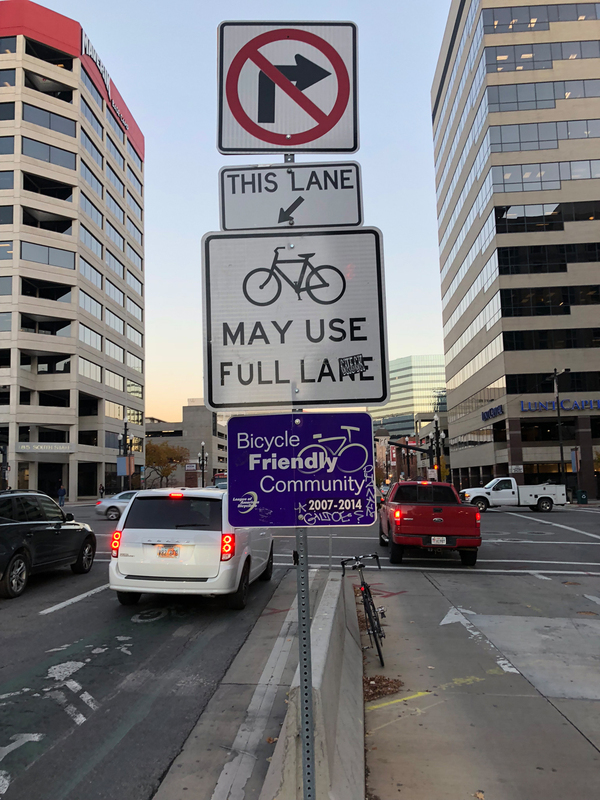 Cyclists should have safe passage through safe road design on this key connector street. 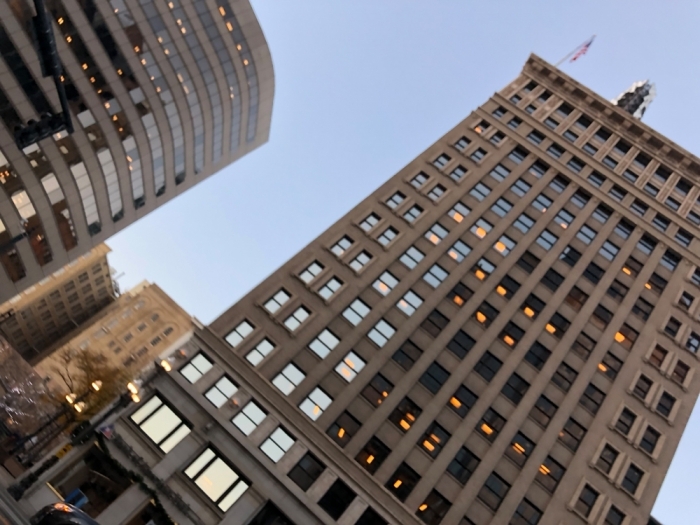 We were on our way to dinner at one of Salt Lake City's fine downtown restaurants, looking to support local business and green transportation. 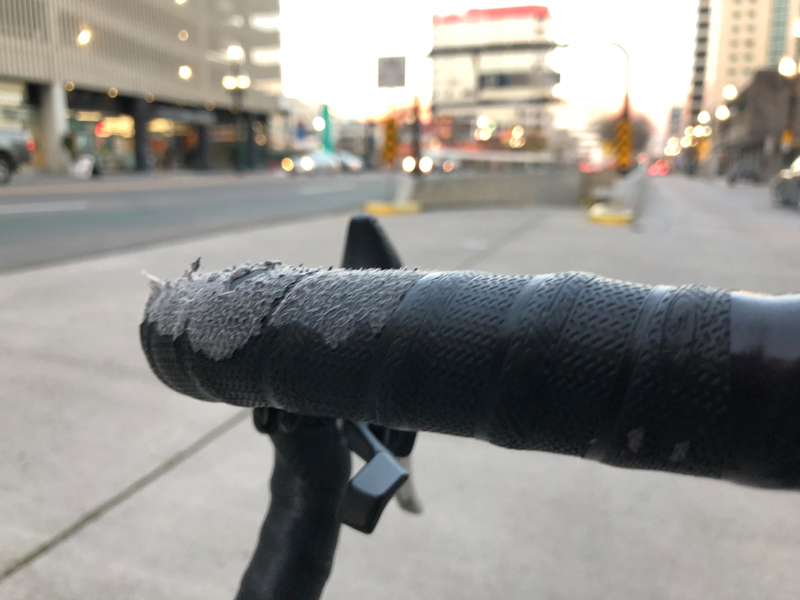 Our ride almost turned into a nightmare. 200 S is one of the only downtown streets running east-west past I-15 to the University, and the only one in the center of town. 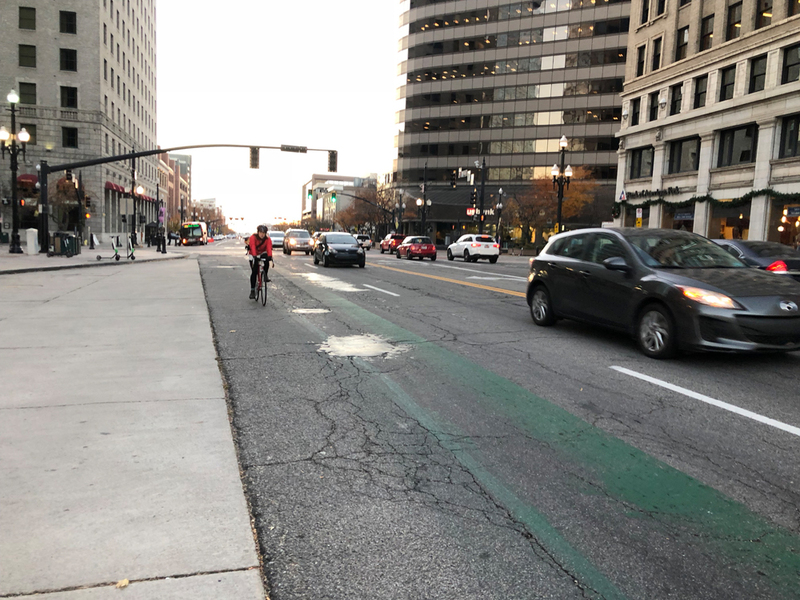 It has been a key commuter bike route for many years, and one that bike advocates pushed to be completed for many years. It was finally finished in August 2009 with the painting of the nationally trend-setting green shared lane markings between State and Main. These lane-within-a-lane markings give a visual signal to motorists that cyclists belong on this road. 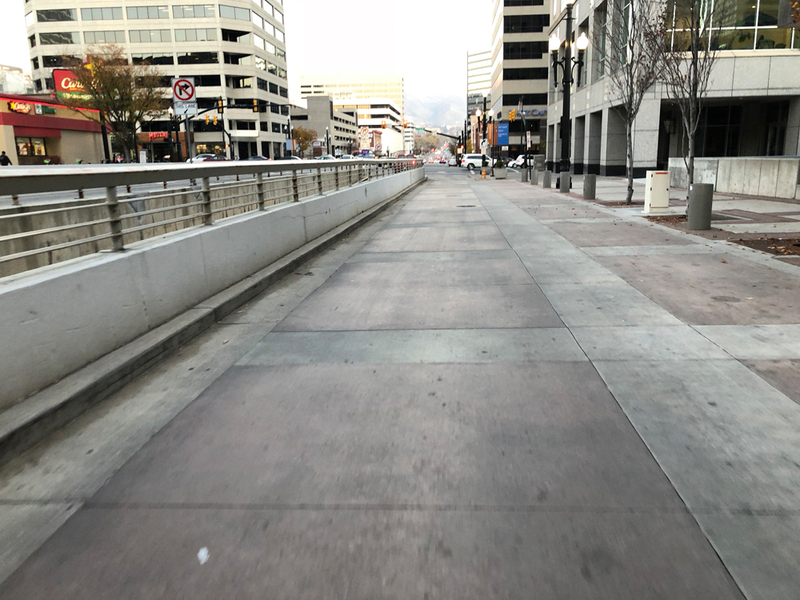 While they are not perfect, they are very useful on streets where there is no room for ordinary bike lanes; and they are not equivalent to sharrows either. 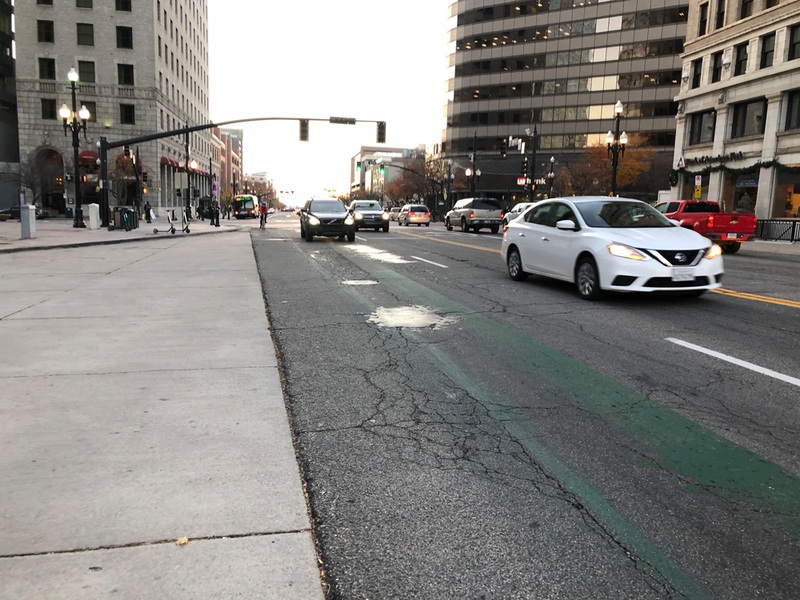 Sadly, while Salt Lake City was the site of the first of these green lanes in the nation, they have deteriorated to the point of being invisible and almost useless on several streets, including 200 S, as well as S. Temple. We are unsure of when the last time these were repainted, but it has been years. 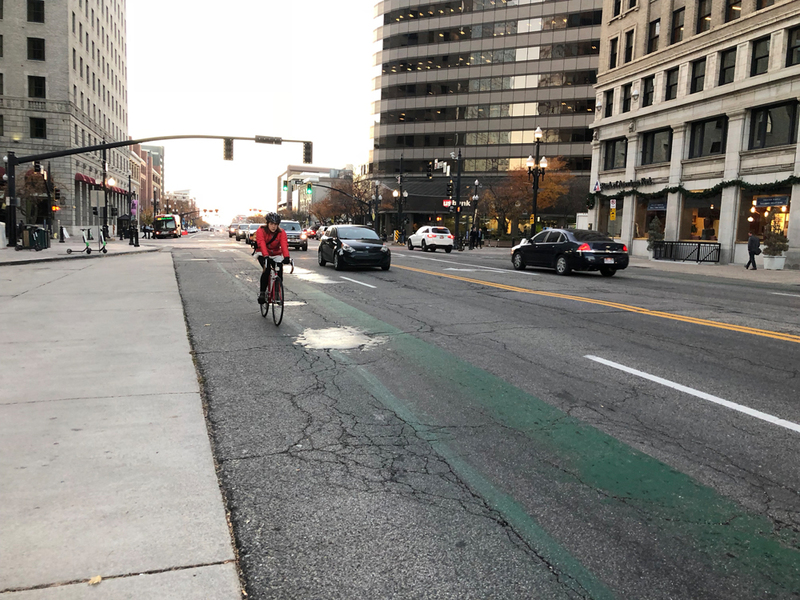 Regarding 200 S, we advocate for the creation of a 1-block protected bike lane on the south side of the road between State and Main, and the repainting of the green lane on the north side of the street. 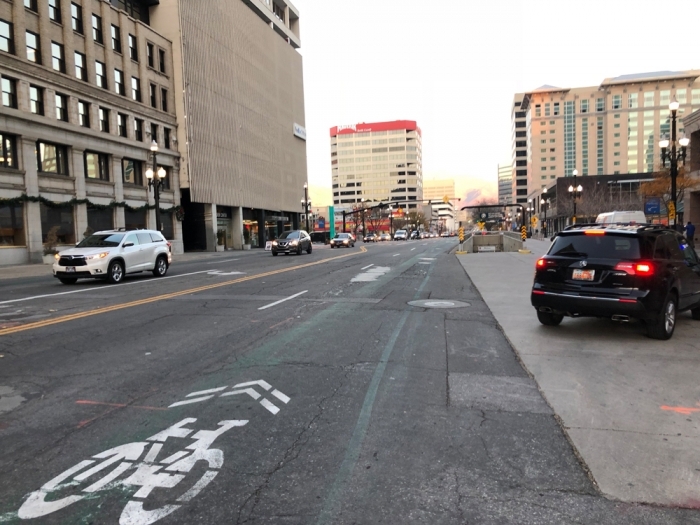 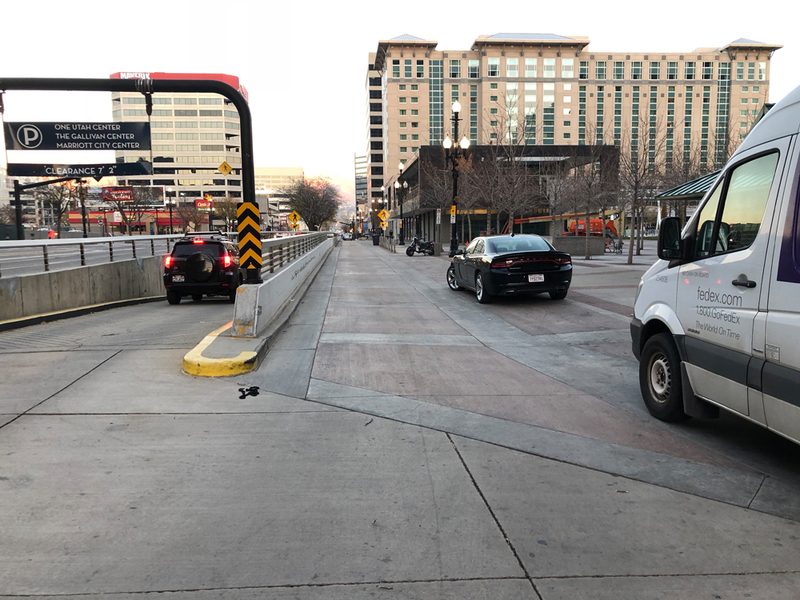 The one-block protected bike lane would run between the parking garage exit and the Gallivan Center and could easily be completed with a couple of signs, and a couple of jersey barriers. 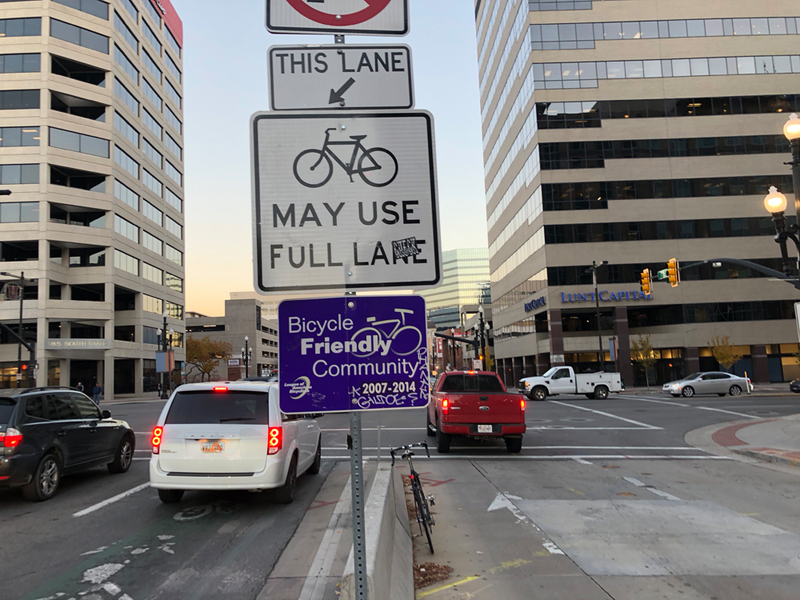 This would give eastbound cyclists a refuge from the 20,000 to 30,000 cars that pass by here each day. 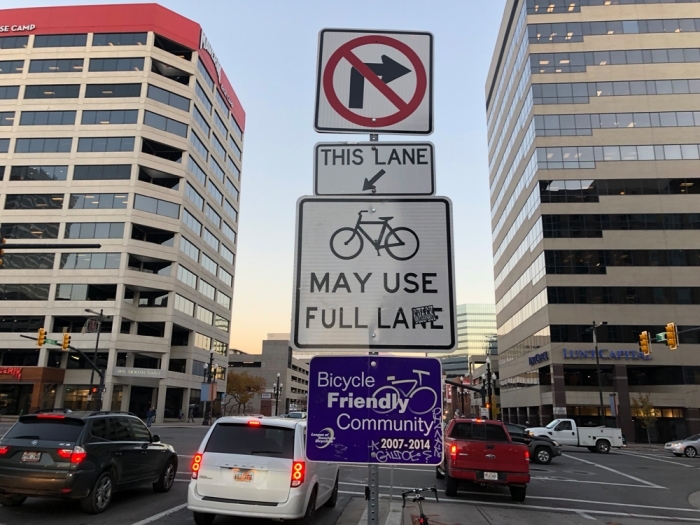 It could be completed in a day or two after a design is settled on. 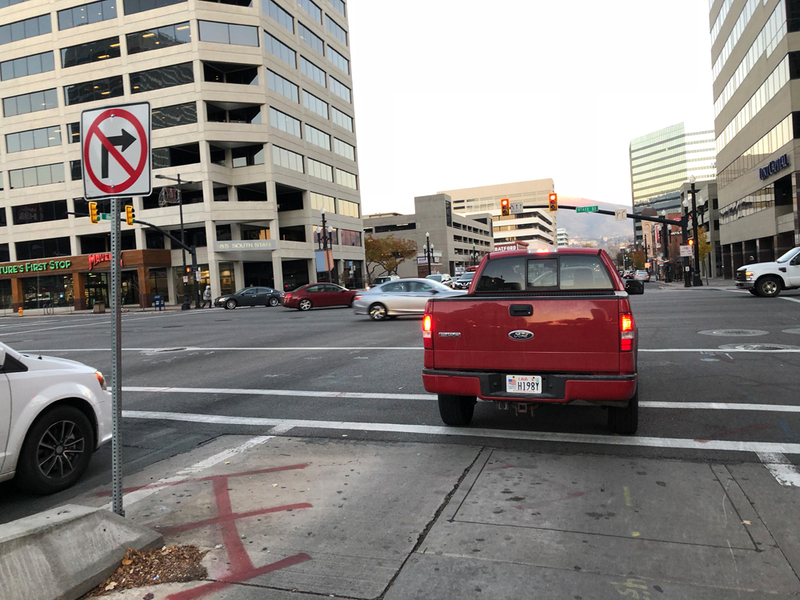 We made some of these suggestions to the previous Transportation Director, but no action occurred. We are hopeful that something will happen now. 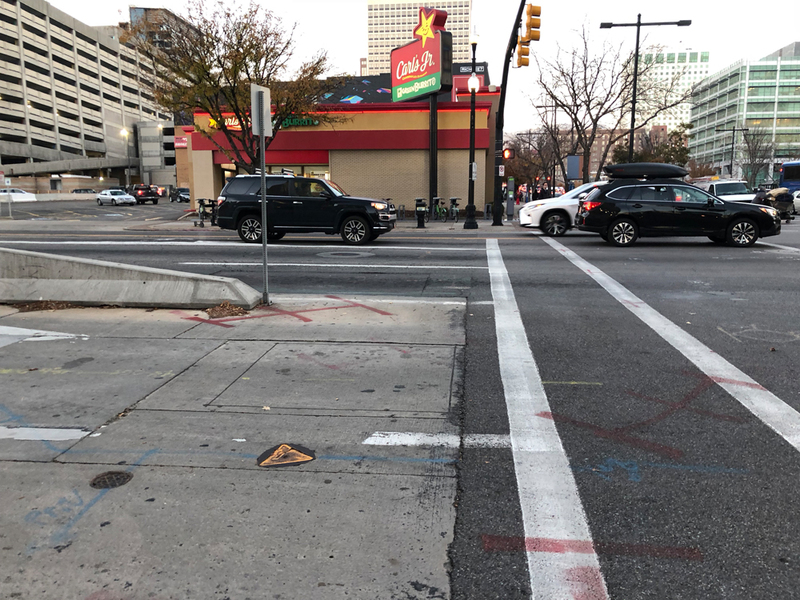 While 200 S is slated to be reconstructed as part of the recently passed $87 million Transportation Street Reconstruction Bond, this won't happen until 2022 and 2023. That is not soon enough for basic maintenance and better safety for cyclists. 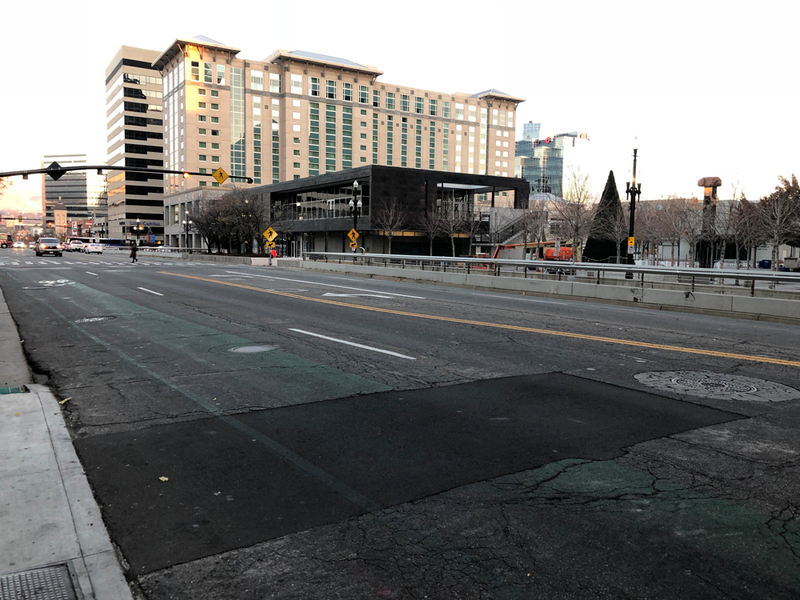 To the west of the Gallivan Center ‘way' to direct cyclists away from the main road and on to the lane closest to the Gallivan Center. 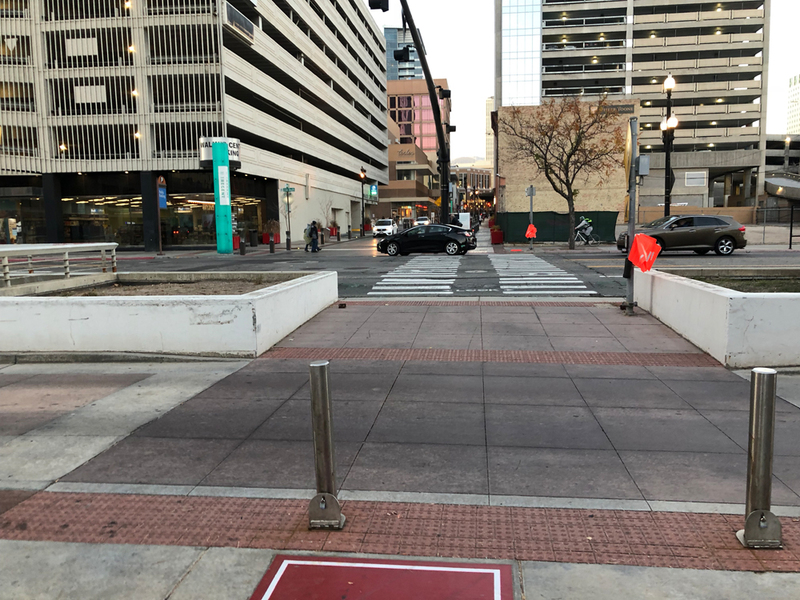 Add a jersey barrier to the north of the parking garage exit on the east side to prevent cars from turning right illegally. 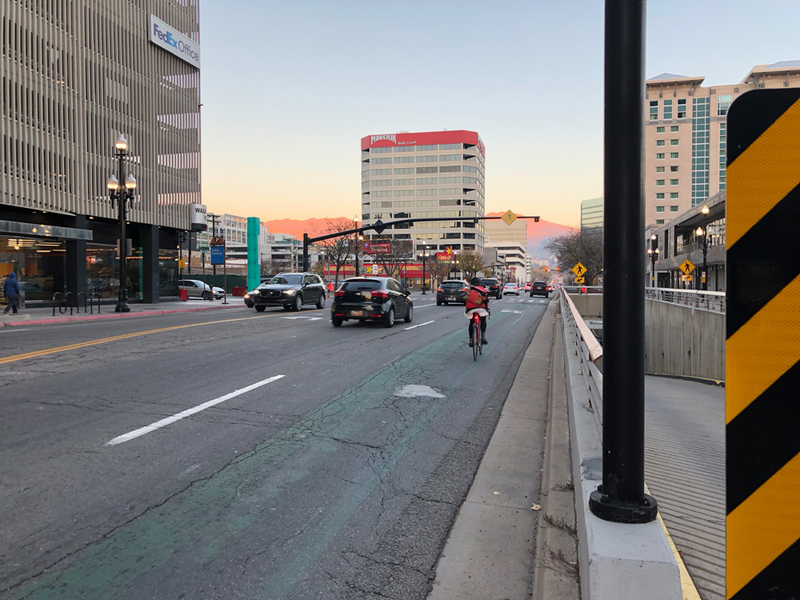 Add signage to indicate that cars exiting the parking garage may not turn right and must go east on 200 S.
Add a painted green skip lane across State Street indicating to cars and cyclists that cyclists may cross. 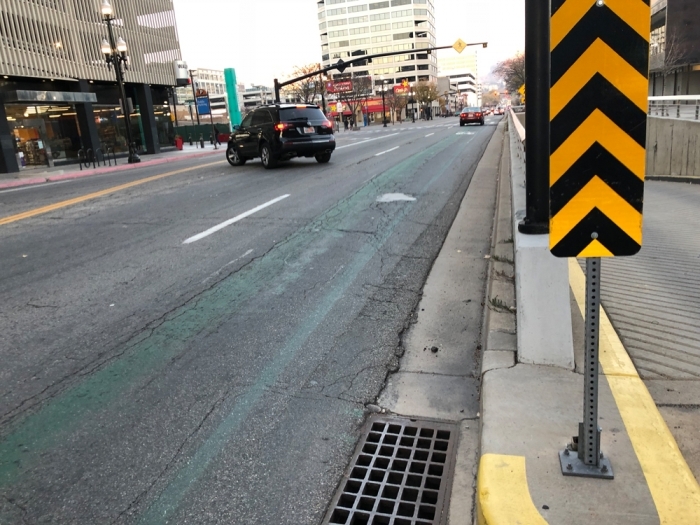 Connect this to the bike lane east of State Street. 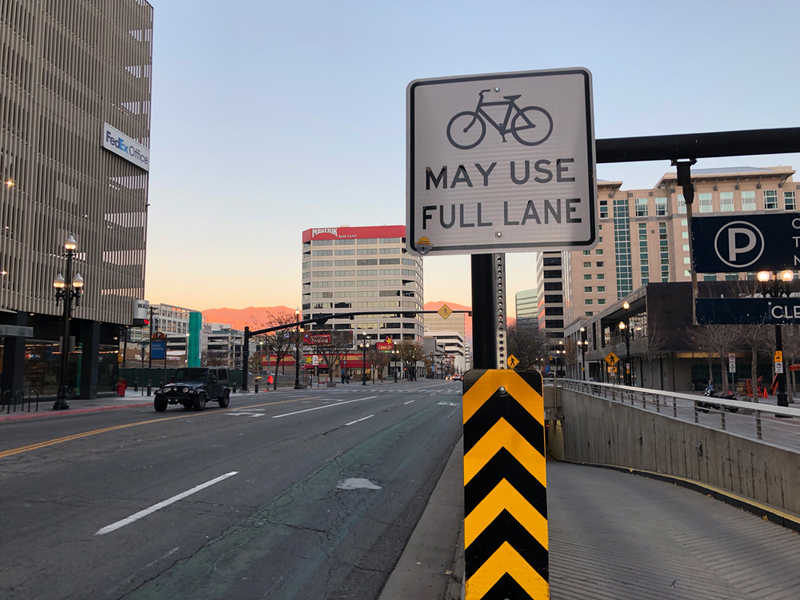 Or, have motorists stop at the exit from the parking garage, and direct cyclists to merge one lane left in order to cross State Street eastbound. 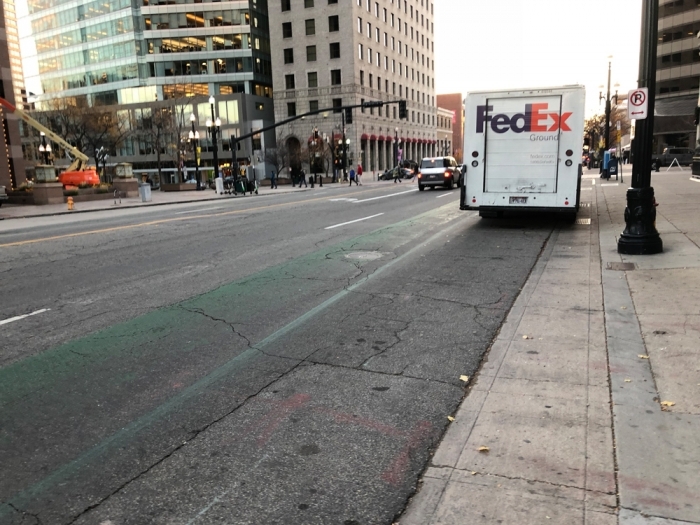 A bare minimum treatment would be to repaint the Green Shared Lane as soon as possible. 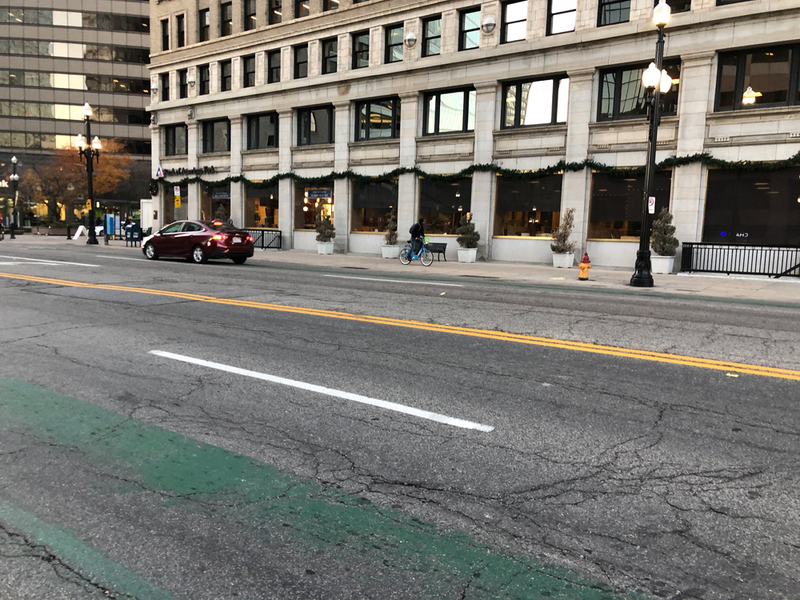 Please repaint the Green Lane. Our suggest treatment of other Green Shared Lanes in Salt Lake City. 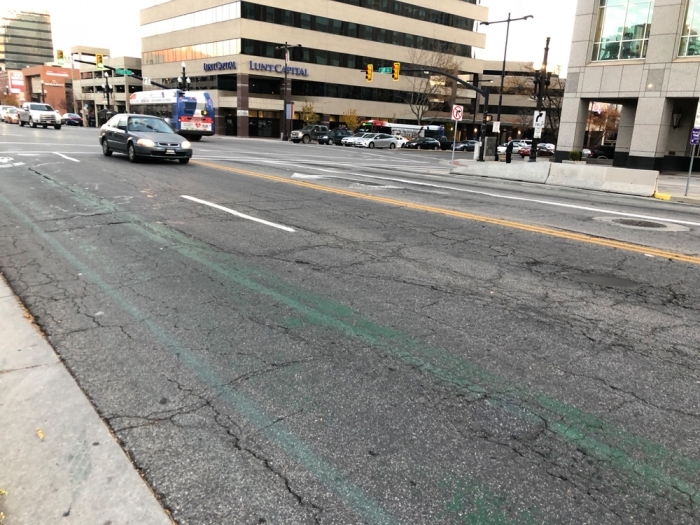 Please repaint all deteriorated Green Shared Lanes; particularly those on 200 S, and on S. Temple. Please consider adding them in other key places such as N. Temple between 300 S and State Street. 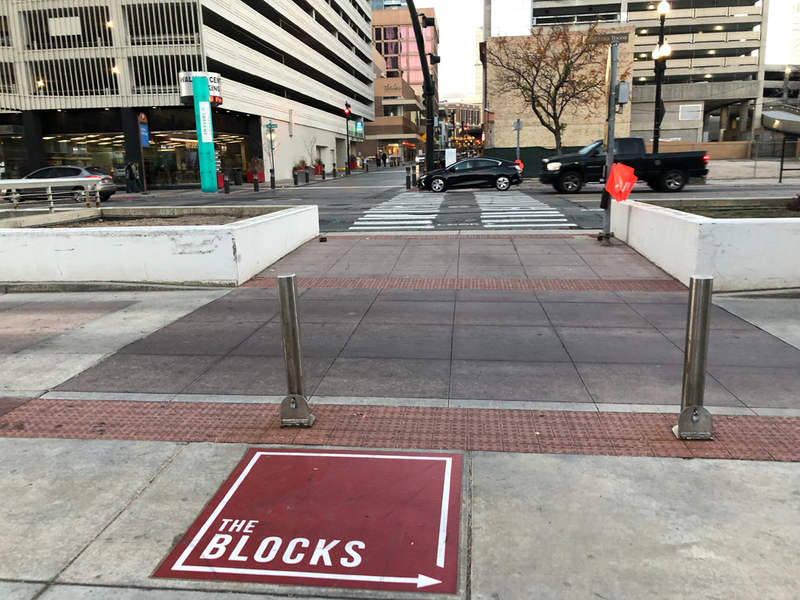 This would be a simple improvement and would help to make this key downtown block safer for cyclists. 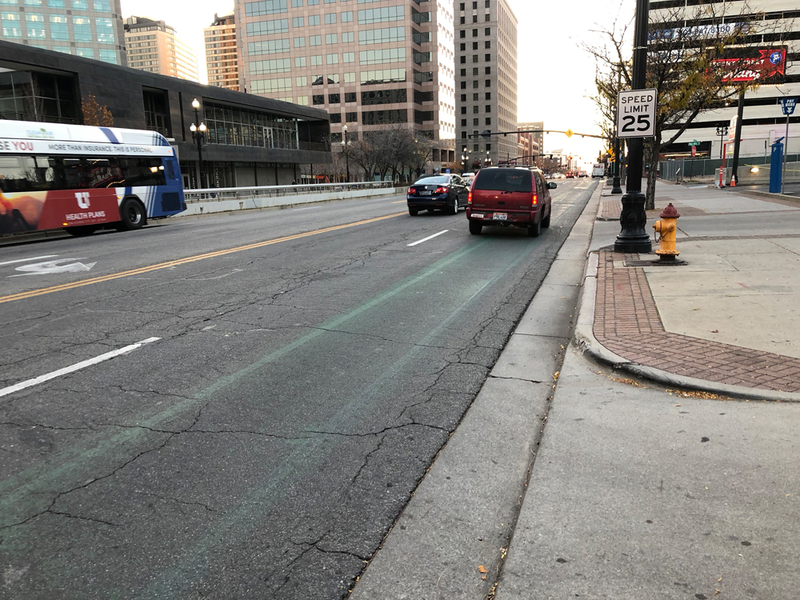 We'd love to see a protected bike lane on the entire length of 200 S to complement the protected bike lane on 300 S, but as a minimum, this one block section needs to be safer. 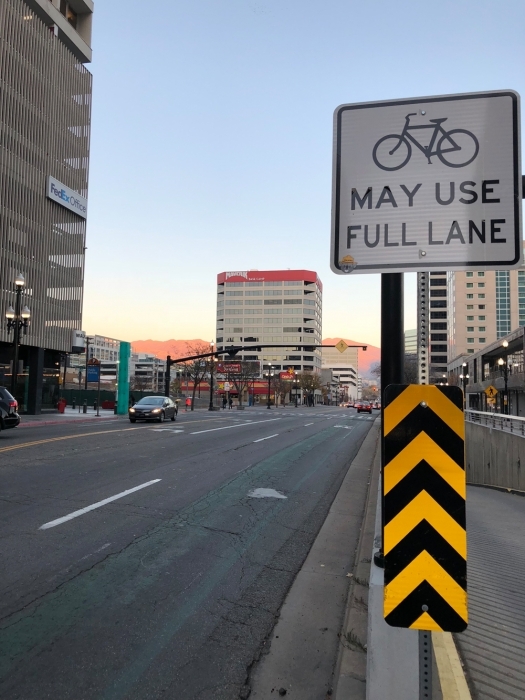 Salt Lake City proposed a 200 S Bicycle Greenway a number of years ago, but opted to create protected bike lanes on 300 S. instead. 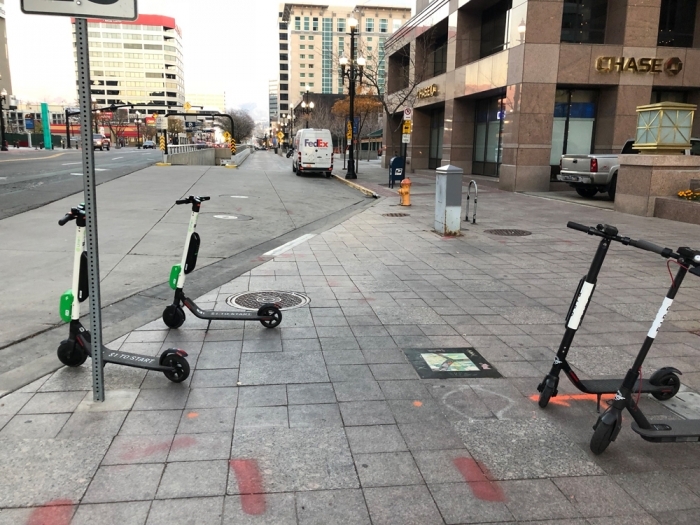 We'd like to see the revival of the 200 S proposal too. 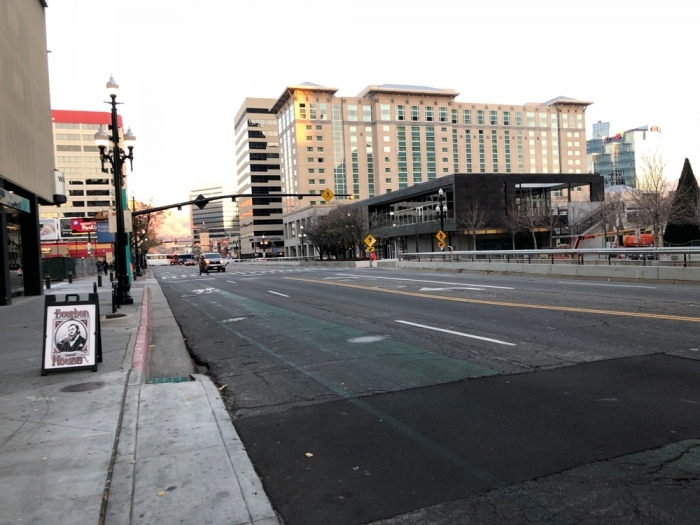 Our proposal for a safer roadway design on 200 S between State and Main is low cost, and could be implemented quickly. 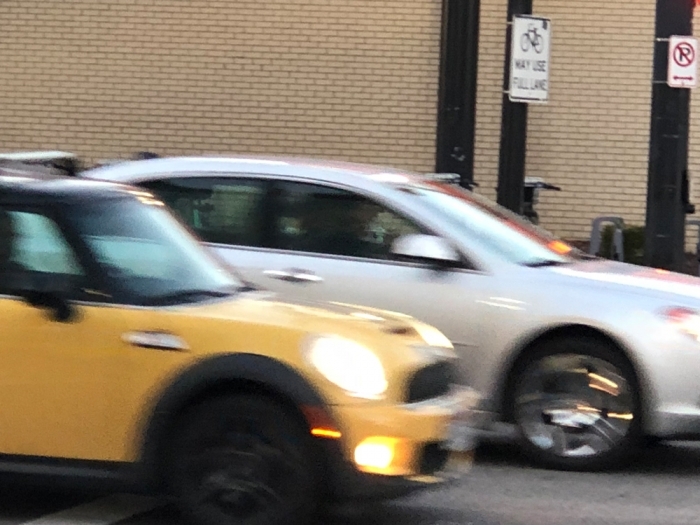 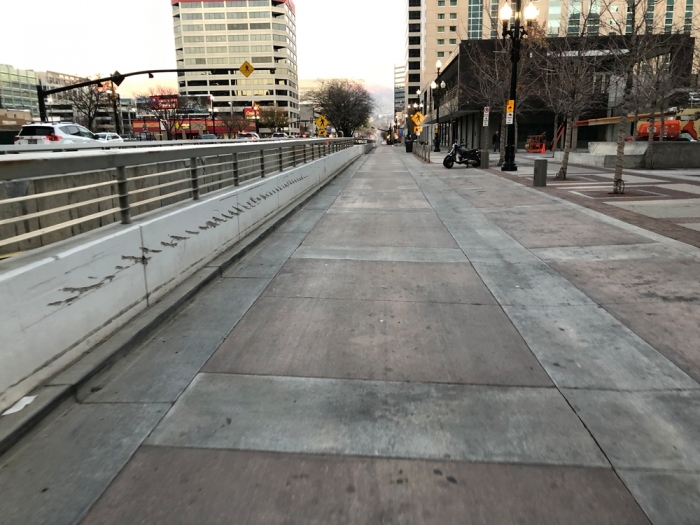 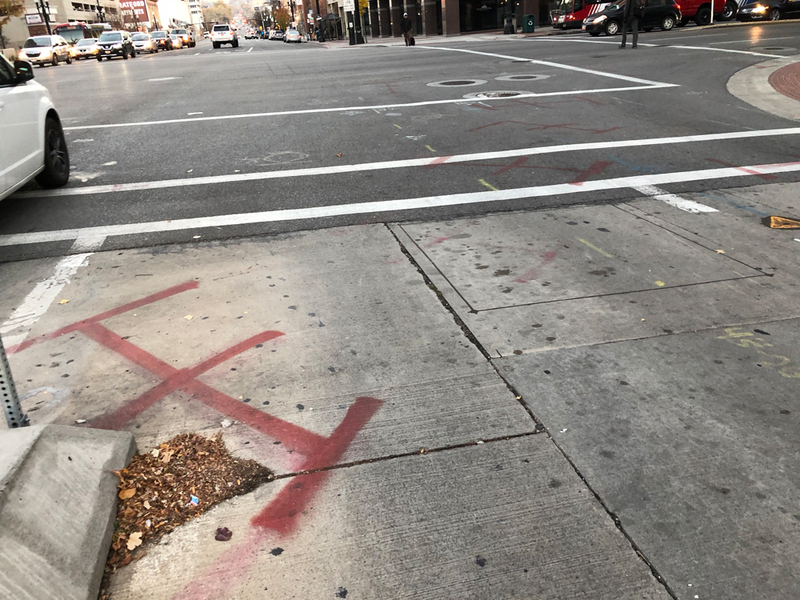 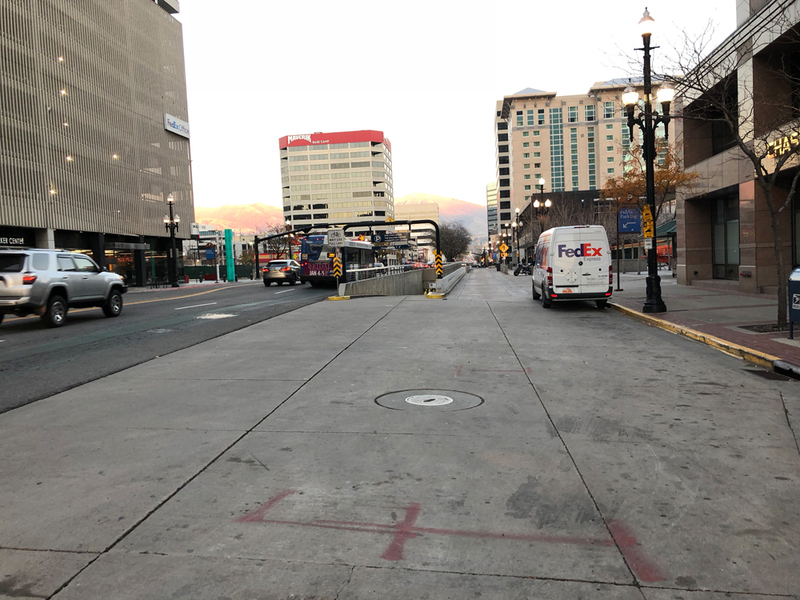 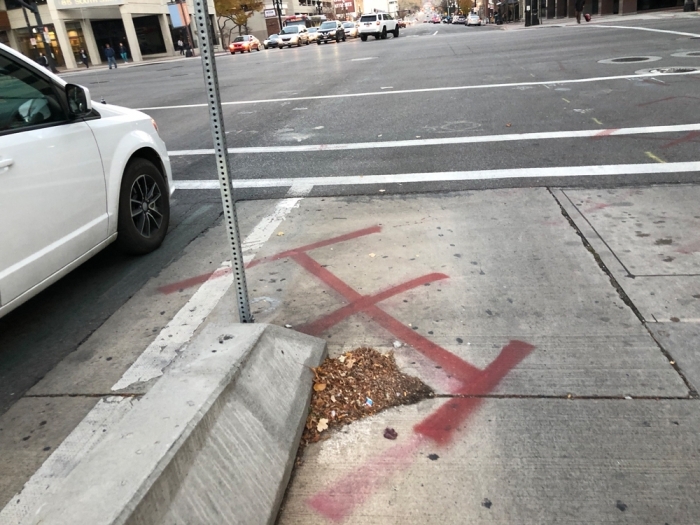 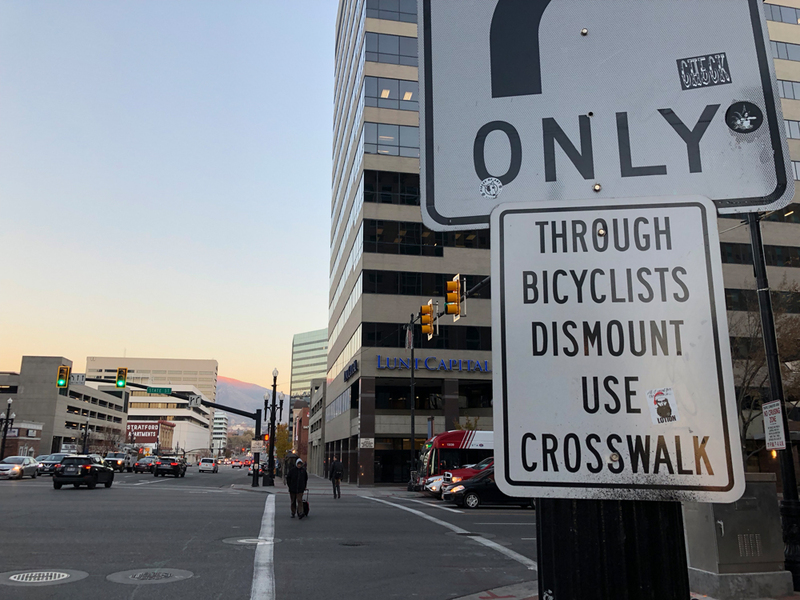 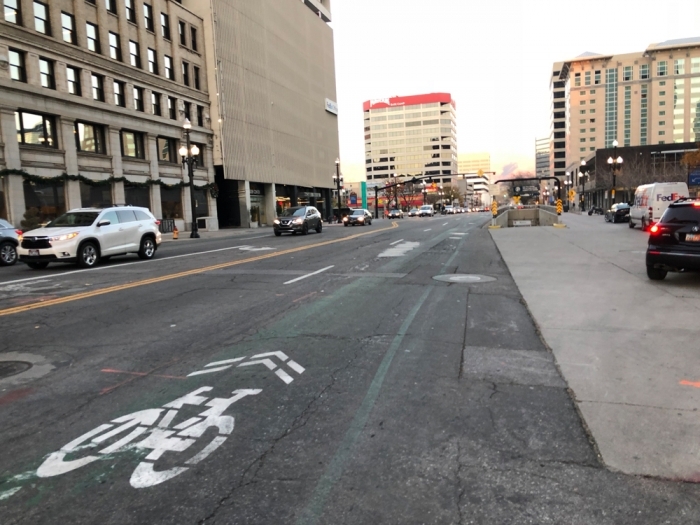 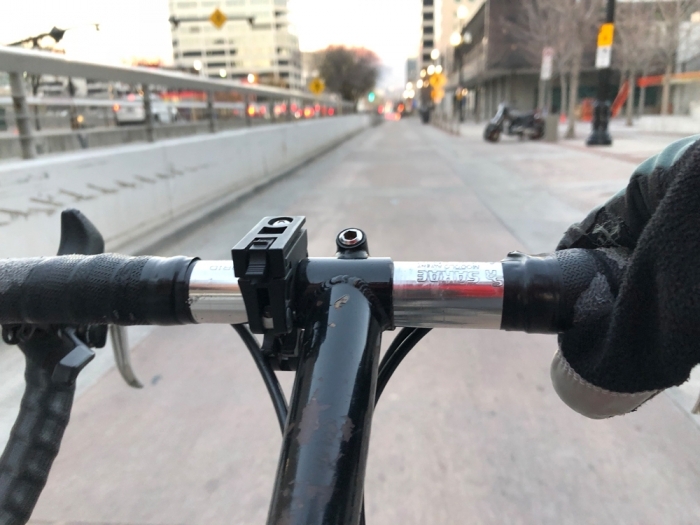 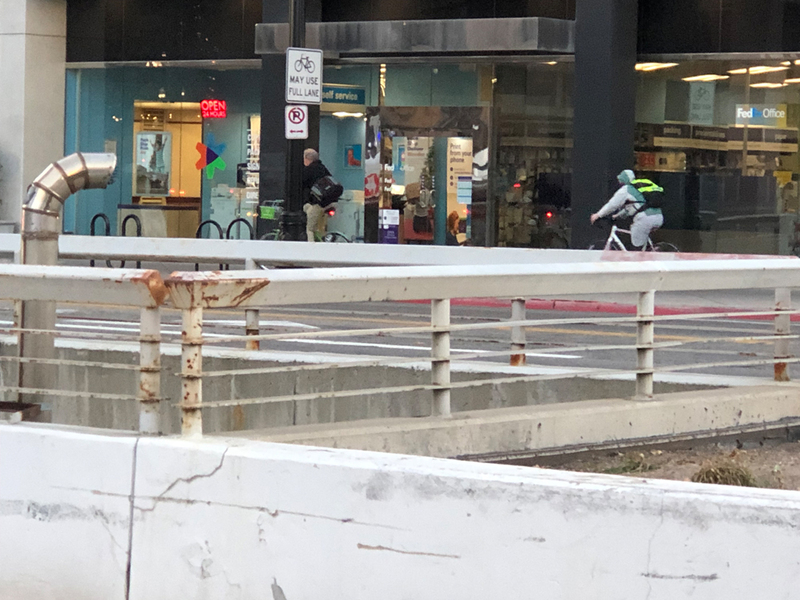 Salt Lake City needs to do something here – the long term neglect is no longer acceptable or safe; and cyclist cannot wait for 4-5 more years for safety on this downtown street. 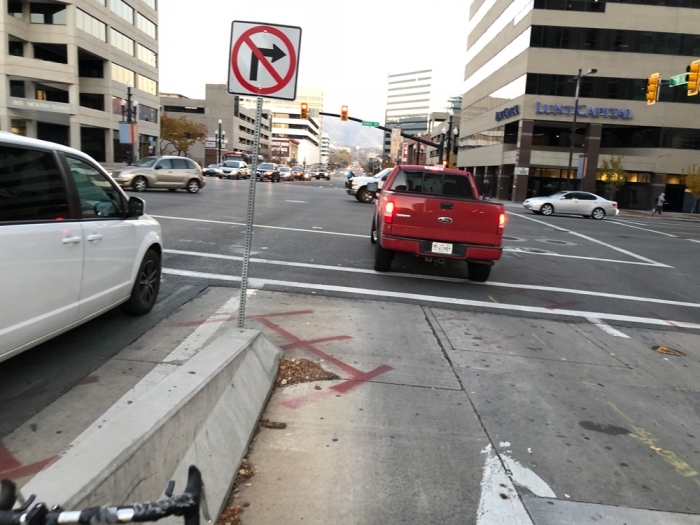 One Response to "Editorial: 200 S in Salt Lake City Needs a(t least) (a 1-block) Protected Bike Lane"